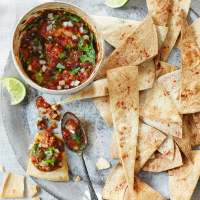 Your first taste of this smoky salsa will convince you that it was worth all the charring. 1. Stir the onion into the lime juice and set aside to soak. Preheat the grill to high. Place the tomatoes cut-side up in a shallow baking tray lined with foil, then season. Grill on the top rack of the oven until blackened – about 10 minutes. Set aside and heat the oven to 220 ̊C, gas mark 7. 2. Meanwhile, heat a dry, non-stick heavy-based frying pan and gently cook the jalapenos and garlic, turning over a low-medium heat for about 10 minutes, or until blackened on all sides. Put in a plastic bag to steam for a few minutes, then peel. Deseed the jalapenos; discard the stems. 3. Finely chop the jalapeno and garlic flesh with the tomatoes and coriander leaves, then mix with the chipotle paste until smooth (or pulse in a food processor). Transfer to a serving bowl and stir in the onion and lime juice; season. 4. Brush the tortillas on both sides with the oil and cut into shards. Spread in a single layer on a large baking sheet and bake for 8-10 minutes, until golden. Season with salt and paprika and serve with the salsa, scattered with a little extra coriander.